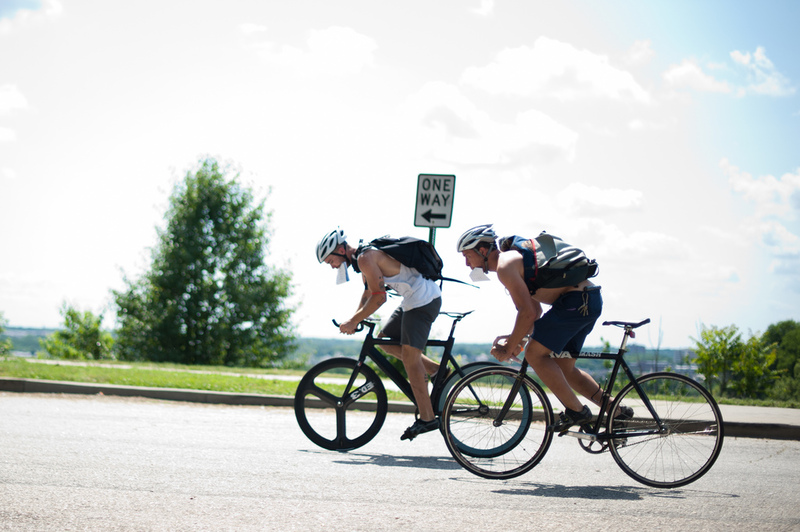 This past Saturday we headed down to Richmond, Virginia, to see the North American Cycle Courier Championships. NACCC 2012 photo © Smoke To Ink. The qualifying rounds and premium rush race took place in Chimborazo Park, which is located in historic Church Hill. Back in the day, kids (like me) living in the West End of Richmond were forbidden to go anywhere near Church Hill. And with good reason. The yuppie to crackhead ratio in late 80s Church Hill had not yet flipped from gunplay and needles in the street to the baby stroller and labradoodle side of the ledger. In other words, I can’t remember ever visiting Chimborazo park, which is sad because it’s a great venue. And no needles anywhere. Home to an annual VACX race, the course layout for the courier race definitely had a cyclocross vibe to it. Nice cobbled section, good off-road sector, a couple dismounts, it was like cross with packages. Unlike a cross race, a closed-course courier race is not chock full of action. There’s a little head-to-head racing as guys lock on to the most efficient way to complete their manifests, but for the most part it’s every messenger for themselves. This meant that editing the video in a way that showed the excitement of the day was a bit of a challenge.But we made it work, dammit. Crosshairs Cycling had a handful of guys–the Seans, Evil Steve and Hood Ornament–racing. Sean O’Donnell ended up fourth in the premium rush race (against some great competition) and everybody made it into the finals. O’Donnell also grabbed a camera and got some killer shots that he has available on his Flickr account and on his Tumblr. Here’s some video. Sham 69 supplies the soundtrack. They don’t have a working website but go grab some tracks from iTunes. Good Stuff.